Den laveste pris i Firenze for centrale lejligheder med 3 soveværelser og 3 badeværelser. Stor lejlighed på 140 kvm med 3 soveværelser, 3 badeværelser, køkken og stue; to store overdækkede terrasser. We are the best choice for apartments centrally located with two solution: large apartment on the third floor (3 bedrooms and 3 bathrooms) or panoramic penthouse on the sixth floor (2 bedrooms and 2 bathrooms). 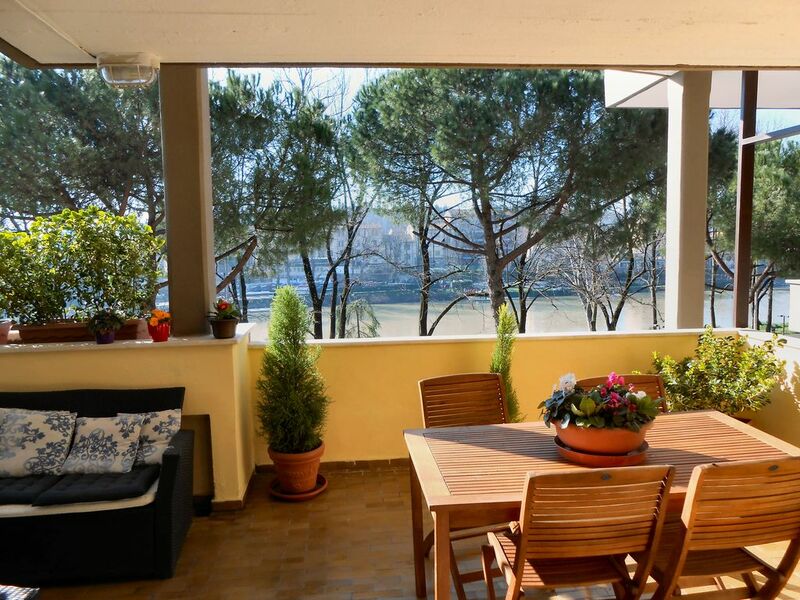 Both apartments have a large covered terrace panoramic overlooking the park on the river Arno, garage, air conditioned, concierge service, all centralized services, WiFi Hight Speed. FOR SPECIAL CONDITIONS AND DISCOUNTS WRITE TO THE OWNER BEFORE BOOKING ON LINE. CENTRAL POSITION: We are on "Lungarno" (the street on river Arno ), one of the most prestigious area of Florence: the favorite by the Florentines. The main attractions can be reached on foot, following the tree-lined park along the river, with outdoor bars and restaurants or with public bus. Beautiful spacious home in a great location! We were three couples traveling together and this apartment was perfect for us. The three bedrooms were large and had very comfortable beds. The kitchen was very well equipped and more than met our needs. It was in a very nice area with a great balcony that overlooked the Arno. What impressed us the most though wasn't this amazing apartment but the owner, Cinzia. After we left Florance we headed to Venice for the Carnival. After our arrival there one of the couples in our group realized they left their costumes in the closet at Campo di Marti. They placed a call to Cinzia and he very graciously drove back to Florence, retrieved and packaged the costumes and shipped them overnight to Venice. Our friends received them in time for Carnival. What amazing customer service. Thank you Cinzia for a great a apartment and experience. You saved the day for our friends! This was a fantastic apartment with great attention to every detail. It was nice to have Piero great us on arrival and answer all of our questions. The apartment was beautiful, very roomy, and situated in an excellent location. Piero put up a Christmas tree and decorations and it was lovely. If you are used to hotter weather you will enjoy the excellent heating. The kitchen was great and had everything you need. We even had wifi and Netflix for down time. Great location near the river and very close to the centre and lots of attractions. Thanks appreciating our attention. We do everything possible to make our guests' stay pleasant and easy. After many busy days in Florence it was so enjoyable to relax in this lovely apartment with views of the Arno. Lots of room to socialize in the kitchen, or on the patio, or in the den. The kitchen surpassed our expectations. The bedrooms were comfortable and three bathrooms generously met our needs. Piero met us promptly and was very kind to show us around the apartment and to recommend local eateries. There were thoughtful touches all around the apartment from maps, bath bombs, writing tablets and pens, to all the personal items which made the apartment a delight. The pictures listed are exactly the same as in person. The view of the Arno River from the patio was beautiful. The apartment was large enough for 6 adults. Piero met us at the Apartment when we arrived and went over all the details of the apartment. We felt safe in the neighborhood. Vi er en af ​​de mest prestigefyldte områder af byen, centrum for et stort kommercielt område med lave priser og fremragende kvalitet (butikkerne og priserne er for Florentinere). Tourist tax: 3 € per person for the first 7 days, excluding children under 12 years. For special conditions and large groups ask the owner before booking. The apartment is registered for the City of Florence to carry out tourist rentals. The garage must be requested at time of booking.